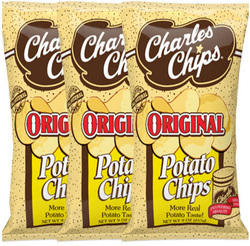 Simplicity sometimes hides great design and Charles Chips bags are great designs. 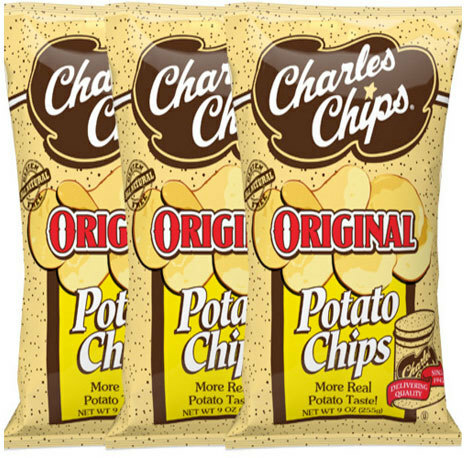 They have maintained their heritage by including the logo, a picture of the tin they home delivered Chips in, up until the 1970s, and most importantly the random brown dots on a creamy brown background. The contents are clearly labelled and color coded. What's not to like. Like all non-Kettle Cooked Chips, the crunch is a more crisp crunch than a hard bitten firm crunch. These are particularly light and crispy, and perhaps suffer a little under the Snap Test. We broke a Chip in half and several parts broke off. Lightly yellow colored, with large bubbles from the frying process. A few had those bubbles broken on what were relatively thin Chips. Most were of a nice size, and they had a medium density of grease left on fingers after a bag plunge. A traditional, somewhat greasy, plain and oil warmed Potato Chip. There really is nothing fancy to this experience. They were more oil than salt and while they would work perfectly well with an elaborate sandwich, they are fairly standard plain Chips.